I found my Ireland golf vacation to be one of the most tantalizing golf experiences I have ever had. The game is very different from what we are accustomed to in the US. Playing the wonderful links style courses is something every golfer needs to try at least once in his golf lifetime. Of course after having a golf vacation in the British Isles it is not uncommon for people to begin planning for a return trip. Playing a links style course takes a tremendous amount of imagination, patience and creativity. The ground is usually very firm, the wind can blow ferociously, and blind tee shots are not uncommon. A golf vacation in Ireland is best booked between June and September to avoid the ugliest of weather. When you go be prepared for all kinds of conditions. When you book your golf vacation in look for bed and breakfasts that cater to the needs of golfers. They are very accommodating and accustomed to players getting early starts and returning late from the wonderful Irish pubs. Royal Portrush located in County Antrim. If you are arriving via the Belfast International Airport you are approximately half way between these two must play courses. 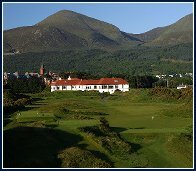 Royal County Down is located about an hour south of Belfast and Royal Portrush is a similar distance to the north. 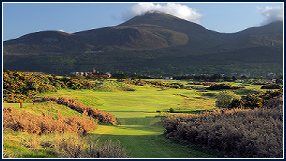 Northern Ireland is ladened with spectacular golf courses including the likes of Ballycastle Golf Club, Kilkeel, Bright Castle, Bangor, Castlerock and Portstewart.